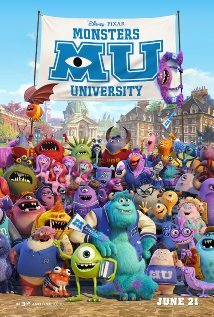 Monsters University – 3.5/5 – Pixar films; they are regarded as some of the best films in the movie industry. From the Toy Story trilogy, all the way to films like Up, Wall-E and many others, Pixar has always delivered gems. The reason for their dominance in film making is that even though they produce animated features, there is a humane quality that an adult can appreciate, and a child can enjoy. This kind of balance is what makes the characters enduring, the stories relevant and most of all, their films entertaining. Even for this, the great Pixar can make some duds (Cars 2, Brave). Monsters University is a prequel to the original Monsters Inc., and even though it is rehashing of familiar characters, this prequel does provide what majority of Pixar films deliver, a balanced gem. In the end, even for some predictable elements and common movie themes, Monster University delivers a film that hits at the heart of true friendship. Premise: Mike Wazowski and James P. Sullivan is an inseparable pair at Monsters Inc., but that wasn’t always the case in the past. From the moment these two met, the mismatched monsters couldn’t stand each other at Monsters University. Through some terrible choices and fateful circumstances, their paths became one, as they see that even for differences; they are truly a reflection of both. What they come to find out is how to overcome their differences and become the best of friends. At the heart of this film, are the two main characters of Mike Wazowski and James P. Sullivan. They are voiced by Billy Crystal and John Goodman, respectfully. In these roles, the two actors reprise two distinct, but still lovable monsters from the original, but in this prequel are monsters who are trying to prove they belong in the Scare School of Monsters University. Even in providing just voices, these two great actors provide real individuals with standout characteristics. As Mike, Billy Crystal provides us someone who is a hard working, focused and always has a plan. In school, he is a real book nerd. He is by the books, through it all. This appeal helps provide a contrast to the arrogant, but happy go lucky Sullivan, voiced by John Goodman. He has a slacker’s mentality, but deep down, he has a heart and admiration for Mike, even if the doesn’t tell him. The slacker appeal helps provides enough complimentary traits to Mike’s nerdiness, that the chemistry is obvious, enjoyable but endearing. You watch as these opposite attract, as in the most challenging, they are just one in the same. Outside of these two characters, we have a few notable characters that stand out. You have the Dean of the school (Helen Mirren), The fraternity brothers Squishy (Peter Sohn), Don (Joel Murray), Terri (Sean Haynes), Terry (Dave Foley), Art (Charlie), the roommate Randy (Steve Buscemi) and the opposing fraternity leader Johnny Worthington (Nathan Fillion) to name a few. In these roles, they are comparable to Mike and Sullivan, helping provide complimentary and distinct characters, which help flesh out the university structure, life and monsters in the film. From here, the film follows the trait of many misfit style films, but the one thing this movie has over the other ones of this genre, is that you care about what happens to the group of guys, especially Mike and Sullivan. When the film comes to the final challenge, it does not cop out with the final challenge leading to happily ever after ending. Here, we see a change of structure, as the film turns and forces Mike and Sullivan into an even direr situation. Here, this last half shows the films true heart, and the reason behind the challenges, struggles, and the things that will make both succeed, true friendship. Here is where Pixar shines, as it gives a meaning to struggle, determination and sacrifice that is humane, even if it is animated. When the film ends, you see that balance of a Pixar film. You see that heart that an adult can cherish, and a child can enjoy. The visuals of the film are truly awe aspiring, wonderful and authentic. So much of the film takes place on the campus of Monsters University, and it is done in both a raw and colorful way. From the creation of the halls, library, fraternities, to the characters that portray ‘college life’ you feel as if this is a real place. A lot of the angles are sweeping aspects that combine with familiar close-ups. This helps draw you in, and become encapsulated by the area, drawing you in and leaving you speechless. The score is resonating, but it isn’t much important as the story, characters and visuals. Overall, even for the common themes, few cliché elements, Monsters University still finds that balance that makes it a true Pixar film. If you’re looking for a great film to take your kids or a fan of Pixar in general, this is a film for you.